Sadly Thanksgiving is a memory and we are on to the Christmas crunch!! I know I’m already behind so making a few cards here and there will hopefully help me out! 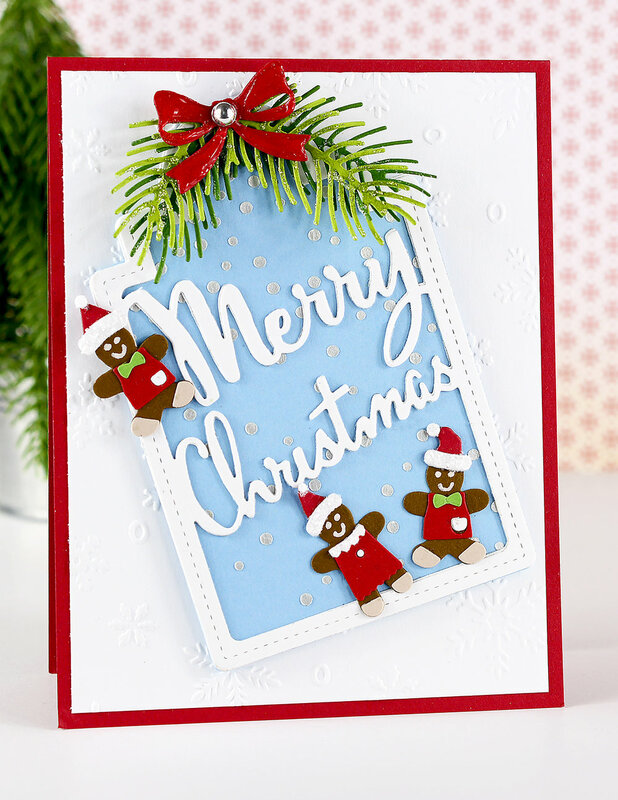 Poppystamps has a new mini holiday release of 13 dies! You can see them here in the Poppystamps store under the 2017 Winter Release title. PLUS Poppystamps is having a Blog Blitz for this release!! You could win BOTH the Gingerbread Boy and Girl die sets by commenting on my post today!! More information about the Blog Blitz below!! My project for today is a tag card. 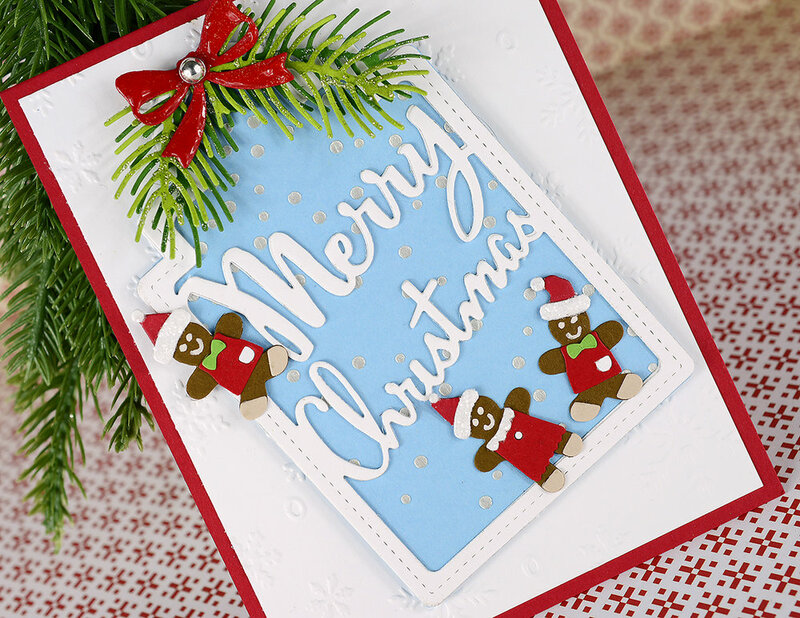 I used Poppystamps Merry Christmas Tag as my main feature and added Gingerbread Boys and a Gingerbread Girl plus a pine bough with a festive red bow. The Gingerbread kids have the cutest clothes and the Holiday Hats fit them perfectly! To add their happy faces I used a white gel pen. My video will show you how I created the snowfall background using Memory Box Tiny Dots Stencil and modeling paste! I added a silver dot to the center of the bow after I made the video; I thought it needed a little somethin’ somethin’ to finish the card! 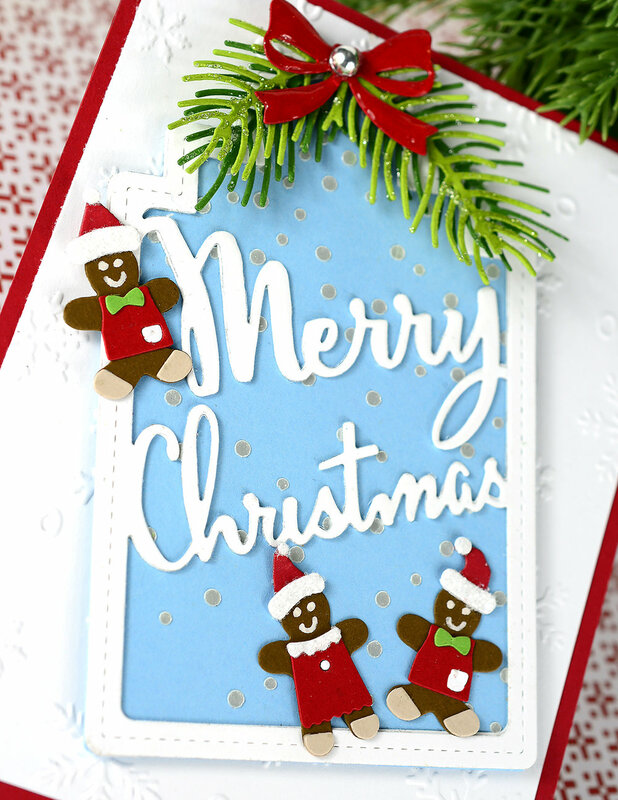 If you would like to win the Gingerbread Boy and Gingerbread Girl die sets, here is what you need to do! Poppystamps blog blitz runs from November 20-30, 2017. Poppystamps is giving away a prize on every BLOG BLITZ post during this time. To win you must leave a comment on each post you wish to enter. To enter ALL the posts during the blog blitz you need to leave a comment on EACH ONE. One person will be chosen at random from each of the posts during the blog blitz. Only one prize per person per blog blitz. A random number generator is used to select winners from comments. You have until midnight US EST December 2 to leave a comment on each and every post you wish to enter. Winners will be announced on this blog on December 5. Please leave a comment…it’s the only way to win!! !